These two sets of money word problems require students to solve problems with smaller amounts of money (mostly bills, but some bills and coins) and larger amounts of money (just bills). 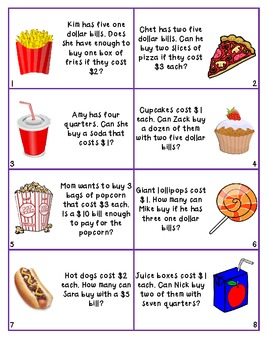 The first set relates to buying snacks with smaller amounts of money, and the other to buying items in a toy store with larger amounts of money. Students are given the amount of money they have and the price of the item. Some problems have two steps – students must determine if they have enough money to buy more than one of the item. These problems can be used in a small group or as a math center for individual students.